Some of the DRT technologies are installed at the following places. DRT unit is in operation to convert the daily kitchen wastes into organic fertilizer at Sahid Hotel in Jakarta. This is one of waste recycling project led by Ministry of Culture and Tourism, Government of Indonesia. The processed organic fertilizer is used in the garden area of the hotel and the well grown organic products are served to the hotel guest. The project contributes to appeal their environmental-friendly hotel management. As Nusa Dua Resort is a tourism headquarter in Bali, the environmental matter is one of most important factors to be cared about. DRT is installed for Kitchen/Restaurant waste management that comes out of hotels in this area. Presentation on DRT has been held for Bali Tourism Development Corporation, who takes care of this DRT on behalf of Ministry of Culture and Tourism, Government of Indonesia. In Philippines, DRT demonstration has been made for Manila Water, San Miguel Group, Universal of Robina, Philippines Coconut Authority, Bureau of Animal industry, MMDA, DOST, National Solid Waste Commission, Land bank, ADB, DBP etc. and the demonstration are resulting into a number of orders for practical DRT installations. The DRT machine is introduced to the Philippines as a means to help solve the growing waste disposable problem while providing a source of revenues from the sale of fertilizer and carbon credits. In the Philippines, DRT has obtained the Environmental Technology Verification conducted by the Industrial Technology Development Institute of the Department of Science and Technology. It also acquired its accreditation with the National Solid Waste Management Commission. Because of the food tradition, Korean organic waste is known as one of the most difficult object to manage. 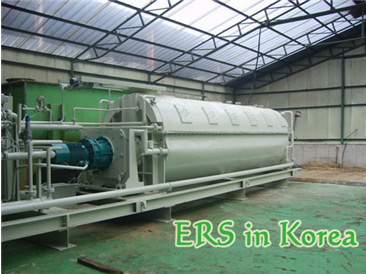 As the result of examination for Korean waste by DRT, the technology has been finally installed in Seoul, Korea for their organic waste management. Hainang island, China is the first place we installed DRT where DRT validity on Fish Meal processing is confirmed to the first time. While international fish meal market avoid Chinese-made products because undesirable chemicals are found in their fish meal, only DRT fish meal enjoys its reputed quality in the market, in spite the origin is China. Under J/V project with Majuikan, which is 100% subsidiary of Malaysian Fishery ministry, Fish meal factory with DRT technology is on going at Kota Bahru, Malaysia since 2006. 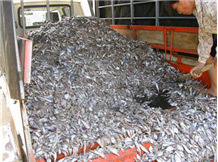 According to the research by Fishery Ministry, about 750 tons of unusable trash fishes are found to be dumped in the sea every day. While existing fishmeal factories hesitate to manage trash fishes because of the environmental problem such as bad smells and drains emitted on the way of process, DRT technology has a totally different solution to convert small trash fishes into excellent quality fish meals. Management of trimmed tree waste is a serious environmental problem. 5% of organic waste, 20% of soil and 75% of trimmed tree are mixed. Mixed materials are put into DRT to convert them into excellent, light weight soils. Root plants are grown on the roof of a hospital. The tree planted roof result hospital in the save of heat & cooling cost, help clean the air, provide shelter from the wind and the sun. Earthworms are already grown in 3 days after the soil is put on the roof. In the light weight soil, the plants grow in a straight shape. 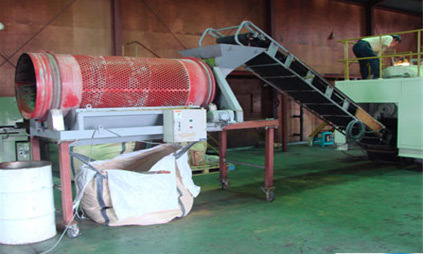 Okinawa Ham has tried to convert food waste such as Ham, Sausage, vegetable, potato and bagasse etc., into fertilizer. However the odor emission from the process caused to fail the project in this food factory which is open to tourists. DRT feed→Thrown into waste water treatment pond and odor from the anaerobic treatment pond disappeared in 1 month. 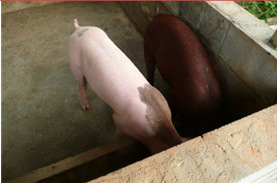 Pig farm where DRT feed has been used→Odor disappeared. The non odor and total zero emission status is realized for the touristic food factory in Okinawa. 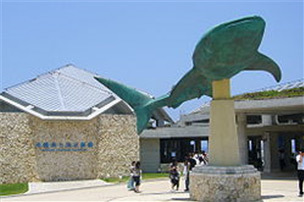 Aquarium under government operation, Churaumi Aquarium enjoys more than 2.5 million guest/year. Treatment for waste from fish feed, unfresh feed, vegetable from restaurant, pruned tree in the park etc. 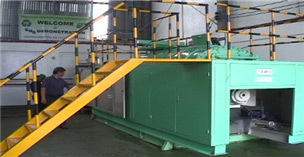 Current fermentation or drying process has not success in converting the waste into fertilizer. 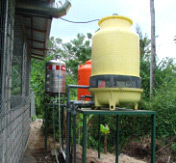 Thus DRT is installed to produce fertilizer without odor or waste water and realized zero emission operation. Cow sludge is managed to convert into Fertilizer.